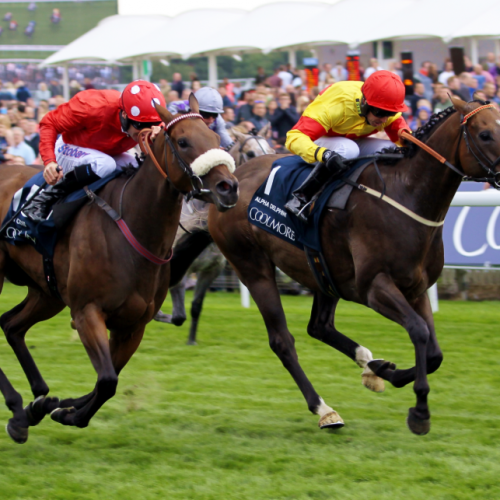 This Group 1 sprint event may not have the most evocative of names – Nunthorpe is an area of York, to the north of the racecourse – but it has plenty going for it. For starters, it is one of a limited number of races in which two-year-olds can compete against their elders. It has also produced some dramatic races. Take the 2010 running. It was won by ‘no-hoper’ Sole Power, at 100-1. To complete a good day for the bookmakers, the third horse home was Piccadilly Filly – also unfancied at 100-1. The previous two runnings went to the popular northern-trained sprinter, Bordlerlescott, star of Robin Bastiman’s small stable. Sole Power won it again in 2014, this time as favourite. The race, over five furlongs (1,000 metres) and staged on the third day of the Welcome to Yorkshire Ebor Festival, has another thing going for it. It is currently sponsored by the prestigious Coolmore Stud. Alpha Delphini sprang a 40-1 shock in the Coolmore Nunthorpe Stakes at York as odds-on favourite Battaash fluffed his lines. The seven-year-old, trained by Bryan Smart and ridden by Graham Lee, edged out Mabs Cross by the smallest of margins after the pair looked inseparable as they crossed the line. It was several minutes before the result of the photo finish was announced, adding to the incredible tension. Similar had happened 12 months ago when Marsha pipped Lady Aurelia. North Yorkshire-based Smart said: “That was the longest five minutes of my life! I backed him this morning, I had a tenner each-way at 80-1 because I thought that was an insulting price. He added: Credit must go to Graham Lee, it was his idea to take the cheekpieces off as he felt that that he couldn’t see the other horses when they came at him. Dods was gracious in defeat and said: “She’s run a super race. Obviously we’d rather have won, but what can you do?